This is one of those doctrines within Objectivism that is so enmeshed in its own confusions and inconsistencies that the critic hardly knows how to entangle its web of errors. But let’s take a stab at it. 1. To begin with, how meaningful is it to declare the “primacy of existence” against the “primacy of consciousness,” given that consciousness is itself a part of existence? Since consciousness exists, blanket statements such as “existence has primacy over consciousness” are confusing. If existence is primary and consciousness is part of existence, then consciousness is "primary" along with everything else that exists. Of course, apologists for Rand will declare that the primacy of existence simply means that consciousness does not create reality, as various forms of idealism imply. But if so, why didn’t Rand just say that consciousness doesn’t create “existence” and be done with it? 2. Rand’s primacy of existence construct is a rather confusing way of stating realism. However, Rand’s equation of the primacy of existence (i.e., realism) with the axiom existence exists leads to a palpable contradiction. According to Objectivism, the axiom existence exists does not specify what exists. As David Kelley notes, “the axiom of existence does not assert the existence of a physical or material world as opposed to a mental one.” So how can Rand suddenly equate “existence exists” with realism? How can such a leap be justified? Well, as a matter of fact, it cannot be justifed. As usual with Rand, her argument is based on leveraging the scandalous vagueness of words to equivocate her way to a predetermined conclusion. The term existence, when Rand first introduces it, is equated with the content of consciousness. Consider the following statement of Rand about consciousness: “If that which you claim to perceive does not exist, what you possess is not consciousness.” This implies that everything one perceives exists, which would only be true if existence is confined to mental content (i.e., the content of consciousness). Both the elephant at the zoo perceived by onlookers and the pink elephant perceived by the drunken sot “exist” according to the logic of Rand’s statement. The only way to escape this conclusion is through equivocation, i.e., by claiming that the drunk does not in fact “perceive” the pink elephant, but merely hallucinates it. However, this would involve an assumption which Rand’s axioms, as they are initially introduced and defended, are unable to support. Rand’s axioms make no such distinction concerning what passes or does not pass for perception. She simply states that something exists, and that consciousness is the faculty that perceives this something. From such a trivial beginning, nothing so specific and meaningful as a distinction between “valid” and “invalid” perception can logically follow. To sum up: it is illogical, even on Rand’s premises, to deduce or infer realism (i.e., the primacy of existence) from the axiom existence exists. 3. Rand’s “primacy of existence” and it’s opposition to the “primacy of consciousness” implies materialism, which contradicts the predominant anti-materialistic tone of Objectivism. Rand defines the “primacy of consciousness as “the notion that the universe has no independent existence, that it is the product of a consciousness (either human or divine or both).” However, if the primacy of consciousness is equated with the belief that existence is the product of consciousness, doesn’t this imply that the primacy of existence should be equated with the belief that consciousness is the product of existence? Now what exactly is this “existence” that Rand declares as “primary”? Rand’s equation of the term existence with the term reality hardly improves matters, since Rand does not go on to define very clearly what she means by the term “reality." By the implications of her confusions, Rand’s reality might be equated with the non-conscious; and once consciousness is divested from reality, materialism easily follows. Seddon’s defense of Rand’s free will. 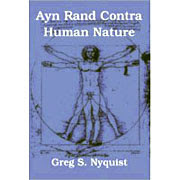 In Fred Seddon’s review of my book Ayn Rand Contra Human Nature, we find the following curious assertion: “I would point out that the Objectivist position is very close to that of Karl Popper.” While superficially there are points in common between Popper’s criticism of determinism and Rand’s, the differences are more telling. 1. First and perhaps most important of all, Popper doesn’t support free will and oppose determinism in order to support a view of human nature that goes against the wisdom of human experience and the evidence of experimental and evolutionary psychology. If Rand’s view of free will were correct, predictions based on human nature would be untenable, since such predictions are generally based on the idea that there exist innate tendencies which will favor certain results over others. Hence, if I claim that great wealth tends over time to soften a nation, making it ripe for destruction, I’m making an inference from human nature. This is an inference which Rand would have rejected on the grounds that people have free will and can choose not to be “softened” by wealth. By claiming that innate tendencies don’t exist, Rand undermines the ability to understand human motivation and the evolution of the social order. Leonard Peikoff, in his short memoir “My Thirty Years with Ayn Rand,” unintentionally demonstrates how Rand’s views on these issues caused havoc in her personal life. “Ayn Rand refused to make collective judgments [about the individuals in her circle]. Each time she unmasked one of these individuals [i.e., broke from them] she struggled to learn from her mistake. But then she would be deceived again by some new variant.” [VOR, 350] Rand’s failure to make “collective judgments” is another way of saying that she failed to respect the home truths of human nature. She expected her acolytes to think, feel and behave like the heroes of Atlas Shrugged, rather than as human beings. She failed to recognize that many of the weaknesses which plague the human animal are congenital, rooted in biology and the human condition, and that they can never be overcome (assuming they can be overcome at all) if they are not first recognized and dealt with in the open. 2. Popper’s arguments against determinism are far more complex and sophisticated than Rand’s. In fact, they are too complicated to be reproduced here. Moreover, Popper does not claim that his arguments decisively refute metaphysical determinism or achieve the status of self-evident axioms. He recognizes that “metaphysical” determinism, because it is “metaphysical,” is irrefutable (i.e., untestable). Popper merely seeks to refute a specific type of determinism, namely, what he calls “scientific” determinism. 3. In his book on determinism, Popper mentions an argument issued by the geneticist J.B.S. Haldane. This argument, first introduced by Haldane in 1898, is so similar to Rand’s that one wonders if there isn’t a connection between the two. Popper quotes Haldane as follows: “I am not myself a materialist [Haldane wrote,] because if materialism is true, it seems to me that we cannot know that it is true. If my opinions are the result of the chemical processes going on in my brain, they are determined by the laws of chemistry, not those of logic.” Although Popper sympathizes with the intent of Haldene’s argument, he understands its weaknesses. “This somewhat strange argument does not, of course, refute the doctrine of “scientific” determinism,” Popper acknowledges. In conclusion: Seddon's claim that Objectivism's position on free will and determinism is "very close" to that of Karl Popper is a palpable exaggeration. Objectivist argument for free will. According to Objectivism, free will is “axiomatic,” which means (1) it’s “self-evident,” “fundamentally given and directly perceived”; and (2) the denial of free will is self-refuting. Let’s examine each of these claims. How, then, do we know that man has volition? It is a self-evident fact, available to any act of introspection. You the reader can perceive every potentiality I have been discussing simply by observing your own consciousness. The extent of your knowledge or intelligence is not relevant here, because the issue is whether you use whatever knowledge and intelligence you do possess. At this moment, for example, you can decide to read attentively and struggle to understand, judge, apply the material — or you can let your attention wander and the words wash over you, half-getting some points, then coming to for a few sentences, then lapsing again into partial focus. If something you read makes you feel fearful or uneasy, you can decide to follow the point anyway and consider it on its merits — or you can brush it aside by an act of evasion, while mumbling some rationalization to still any pangs of guilt. At each moment, you are deciding to think or not to think. The fact that you regularly make these kinds of choices is directly accessible to you, as it is to any volitional consciousness. The principle of volition is a philosophic axiom, with all the features this involves…. Behind Peikoff’s argument is an important but unstated assumption. Peikoff is assuming that acts of introspection yield self-evident truth. Whatever a man observes through introspection is “fundamentally given and directly perceived” and, by implication, axiomatic. So if a man observed himself being controlled by forces not of his making, this would make the principle of determinism a self-evident fact worthy of being embalmed as an axiomatic truth. Does introspection really yield self-evident facts? No, of course not. Nor is it an assumption that any Objectivist, from Rand down, would ever consistently adhere to. People observe through introspection, for example, unbidden emotions which they cannot control. They feel angry, sad, fretful, anxious, regardless of whether they wish to feel these things. As even Objectivism concedes, human beings do not have direct control over emotions. They experience, introspectively, emotions rising up within them, irrespective of any volition. So does this not mean that feelings are determined? Isn’t that the “self-evident” fact directly observed through introspection? But no, not at all. When it comes to emotions, Rand took an entirely different approach: “In the field of introspection,” she declared, “the two guiding questions are: ‘What do I feel?’ and ‘Why do I feel it?’” But wait a minute! Whatever happened to direct contact with the facts assumed by Peikoff in his argument about volition? By implication, Objectivism rejects the notion that emotions are beyond volitional control, even though this is how we experience them in introspection. So if our experience can mislead us in the case of emotions, why can’t it mislead us in reference to attention, focus, and thought? How can introspective observation be “self-evident” in one instance and not the other? This is left unexplained in Objectivism because neither Rand nor any of her disciples ever noticed the inconsistency. This argument gratuitously assumes that the individual must be able to control his own mind in order to know anything. Yet what is the rationale for such an assumption? Why can’t the mind, operating on its own principles, gather in data from external existence, analyze it, and reach conclusions? There is nothing logically inconsistent in such a notion. That it seems a trifle strange does not constitute a self-refutation. It won’t do to confuse the strange or the paradoxical with the illogical. Computers, which are deterministic systems through and through, with no volition of their own, can reach conclusions from data fed to them. Why couldn’t the mind of the determinist behave in a similar fashion? Even more objectionable, however, is the caricature of determinism in Peikoff’s argument. Determinism may be as implausible as you like, but it’s hardly the thin gruel of a doctrine presented by Peikoff. It comes in many different versions and brands, many of which are quite sophisticated and not so easily refuted. One could believe, for example, that while the intellect may be volitional, the will (i.e., Rand’s emotional mechanism) is determined, so that a man may control his mind but not his temper. All kinds of variants and mixtures are possible, most of which are not even broached by Peikoff’s argument. Objectivist theory of free will vs. the facts of reality. In the last two posts I have documented how the Objectivist metaphysics has helped rationalize the eccentricities of David Harriman and closed the Objectivist mind to scientific research into the paranormal. In the larger scheme of things, these are relatively minor faults. Where the Objectivist metaphysics seriously leads its partisans astray is on the issue of free will and human nature. For Rand, free will is axiomatic, which means, “self-evident” and “fundamentally given and directly perceived.” Now whether free will is self-evident I will leave for another post. Here I’m only interested in specific facts that are sacrificed on the alter of Rand’s free will. We all know the rationale behind this particular evasion of the facts. Rand is claiming because people have free will, they cannot possibly be influenced by biological factors. But this is merely an a priori rationalization of the worst sort. Claims about the biological basis of an emotion can only be settled experimentally, through empirical testing. The evidence for the hypothesis that biological factors can influence emotions is overwhelming and not in dispute among psychiatrists familiar with the relevant research. If anyone has any doubt on the score, just consider how diseases of the brain can affect emotion and personality. OK, so Ayn Rand created a cult. What does this have to do with evolutionary psychology [and human nature]? Simple: Contrary to Rand, the fact that human beings care about the opinions of the people around them doesn't stem from philosophical error. It stems from evolution [or human nature]. Human beings evolved in small groups where good relations were vital for survival. People who weren't interested in other people's opinions had trouble staying alive and reproducing. Caring about the opinions of others isn't as immutable as our sexual preferences, but it's very deeply rooted. Consider: How much would I have to pay you to walk in front of an audience of a hundred strangers and make a fool of yourself? Now it’s important here not to get caught up on the merits of evolutionary psychology. The important question here is whether sexual jealousy, age differences, attraction to younger women, concern with what other people think are all built-in features, rather than just premises accepted by “free will.” The evidence over-whelmingly supports the view that some sexual feelings, including jealousy, are hardwired. Nor is it in the least plausible to assume that concern with what other people think is a mere premise which can be "deprogrammed" from the mind through psychotherapy. To deny a human nature consisting of innate propensities is a far more serious matter than denying facts about quantum mechanics or Einstienian relativity. Advanced experimental physics may be important in certain technical fields; but in ordinary life, it hardly matters. You don’t need knowledge of such arcana to get a job and raise a family. But if you don’t understand human nature, you’re probably going to have a much harder time of it navigating one’s way through life. Interacting with other people is what everyone must do. The notion of the man who lives entirely by himself, like Robinson Crusoe, is a myth. To get on in this world, it helps to understand what motivates and drives the people around us. Incorrect assumptions about human nature only leads to just the sort of personal dysfunction as is limned in Anne Heller’s biography of Rand. What makes all of this so much the worse is the intellectual feebleness of Rand’s rationale for evading human nature. But this is a topic which must be reserved for my next post. In a new, special edition of his Intellectual Activist newsletter, former Orthodox Objectivist and Ayn Rand Institute member Robert Tracinski claims the official movement is committing "suicide" with what he is calling "Anthemgate", and predicts a "long, ugly period of crisis". We've already touched on this burgeoning schism - see Neil Parille's excellent coverage here - and it looks to be gaining a real head of steam now. However, rather than being much focussed on the recent controversy over Objectivism's bogus theory of induction, Tracinski's essay turns out to be a rather rambling grab bag of complaints aimed at the increasing authoritarianism of ARI founder Leonard Peikoff. The most interesting point is where Tracinski actually begins to sheet the blame for this authoritarian tendency to Rand herself, specifically her claims that the philosopher is "commander in chief" of all other intellectual disciplines. (We here at the ARCHblog could have told him years ago that this Plato-lite philosophical authoritarianism was central to her system, but I suppose better late than never!) Having discovered this, he then commits a kind of "blank out". Finding himself unable to reconcile this position with Randian characters like Howard Roark, he then decides that while Rand's intellectual authoritarianism is explicit in passages like the "commander in chief" cited from "The New Intellectual", her work is still nonetheless "implicitly" anti-authoritarian. Actually, what this suggests is at the very least that her thinking is obviously inconsistent and even confused, but even this is a heresy even Tracinski cannot quite bring himself to utter; hence he tries to fob it all off on Peikoff's personal tendencies. Perhaps one day he will realise that acorn doesn't fall far from the tree; and that the problem is much deeper, and much, much older.